Why Your Clothing Label Size Doesn’t Matter, Loving Yourself & Feeling Body Confident Does! How would you feel if you could open up your mind to a whole new wardrobe of possibilities? That’s exactly what I did when I stopped caring about the number on the label inside my clothes and let me tell you, it feels fabulous! The clothes size that you wear does not matter; it has no relevance to who you are as a person, your style or your choices. It is literally, just a number. So many people, women in particular, place a massive importance on “being a size 10,” or any clothing size for that matter, but what does that actually mean? Does being a particular size suddenly enter you into some elitist club where you’re elevated to super human status with incredible dress sense? Does it make you truly happy, healthy or a better person? What about giving you a kinder heart; can you show more empathy, grace and love at a particular size? The answer to all of the above is a resounding no. In fact these days, the label doesn’t even accurately dictate the “size” of the garment as with so much inconsistency from brand to brand and the ridiculous nature of vanity sizing, what is considered to be a size 14 in one store could be considerably larger or smaller in another. We’re so focused on labelling, competing and comparing ourselves and our clothes to others around us that we forget to focus on expressing who we truly are and loving ourselves for it. If you are living so much of your life wanting to BE a particular size then you are missing out on BEING who you are. Your happiness, your sense of style and your enjoyment of fashion should not be dictated by the number on a piece of material sewn into a garment. I grew up with hearing women around me, my friends and family included, talking about being a particular size, their constant struggle to maintain or get back to that size and how they wouldn’t wear a particular style of clothing until they reached that number. I still hear it now and it really saddens me. I can vividly remember standing in the changing rooms with one woman in particular who was trying on a pair of trousers in a size 8. She absolutely LOVED everything about them, except that they were cutting into her hips yet she refused to try the same pair on in a size 10 because she ‘wasn’t a 10, she was an 8.’ Instead, she left the shop without the trousers she loved so much but carrying another bad feeling about herself and her body. Perhaps its because I’ve struggled with finding my size in clothes for all of my adult life that I find this kind of mindset incredibly sad and ridiculous in equal proportions. Why miss out on an outfit that you could feel incredible in on a night out, just because the label on the inside of the item that no one can see, yourself included, has a higher number on it than you would usually wear? Buy the clothes that you love the look of and in the size that you feel the most confident and comfortable in. CUT THE DAMN LABEL OUT & SLAY YOUR DAY! When you go into a shop or order online, I always think that it is best to try garments on in two or three sizes. What the heck; you could even take every size on the rack into the changing rooms with you if you wanted to! The way that some garments are cut can mean that many sizes of exactly the same item can fit you so pick the one that you feel you look the best in for the style of item that it is or for how you would like it to fit. For example, if you want to wear a leather jacket open and close fitting, you might like to take a size down and if you’d like your cardigan to be oversized and snuggly or to wear a jumper as a dress then size up. In the same vein, if you try an item that you love on and it’s too small, please don’t hesitate in trying the next size up if its available. Don’t miss out on that gorgeous outfit just because you don’t fit into the number on the label that you’ve conditioned yourself into thinking you are. This also means that you may be able to wear a garment thats in a far smaller or larger label size than you would think you would be and still have it looking amazing. For example, my friend gave me a gorgeous patched together, hanky hem top from All Saints to try on in a size 10. I thought there’d be no way that it would fit me yet it slid on like a glove and looked incredible. Sure it sat on my body differently to how the designer may have envisaged it or how the brand would like to portray the appearance of the top but theres no denying that it looked great on my body. With that in mind, when you see an item that you love, try it on; it may fit you within the label sizes available, it may not. If it doesn’t, move on or try wearing something differently, in your own way. Don’t make the costly mistake that I have countless times in the past by purchasing items that ‘you’ll fit into one day.’ They’ll only end up gathering dust and taking up space in your wardrobe for so many other pieces that will help you to dress confidently as they best version of yourself. 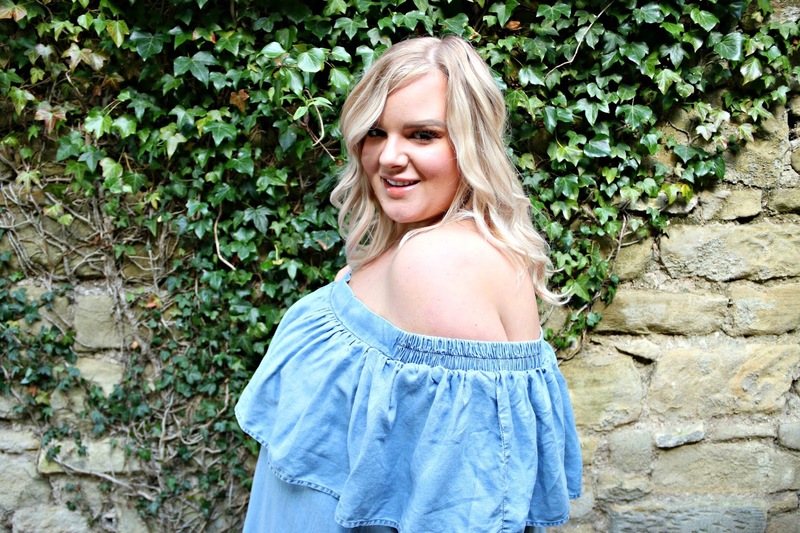 A great example of this is the Chambray Denim Ruffle Bardot Swing Top from Yours Clothing which I have lusted after ever since I saw it online. When I went into store to try it on, I picked up the two sizes that I tend to reach for, plus one larger because the material itself didn’t have a lot of stretch in it. Aside from that gorgeous mid blue chambray denim colour that seems to suit all skin tones and hair colours, what I love about this top is the shape. It is elasticated at the top around the shoulders which is great as it can move to accommodate the breadth of your shoulders and arms. This makes moving around in this top far more comfortable as some bardot styles can be quite rigid and restrictive. It is cut in a swing style so it flares out towards the bottom, which is great news for me as I’m very disproportionately shaped with a far larger tummy than bust which usually throws obstacles in my way when less than stretchy fabrics are concerned. The smaller of the two sizes that I tend to pick up first fitted me, as did the next one up but while they were better across my shoulders and waist, I felt as thought they didn’t skim over my tummy quite as much as I would have liked and the smaller of the two clung in a couple of areas and the shadow of where my belly button is could be seen. This didn’t make me feel as confident in the item on my specific shape as I would have liked and since I intended to wear this piece as a casual, throw on spring/summer item, feeling like that towards it wasn’t ideal. I would have felt as though I’d have to really carefully consider what I wore underneath and perhaps invest in some sucky-in knickers which would add additional cost to an otherwise affordable outfit as well as bulk to the appearance of the outfit. Usually such forward planning of wearing an item results in me leaving it in my wardrobe with the tags still attached for months on end; something I’m vowing to be a thing of the past. What I loved about the top was that it was actually quite long line and could be worn as more of a tunic with leggings. 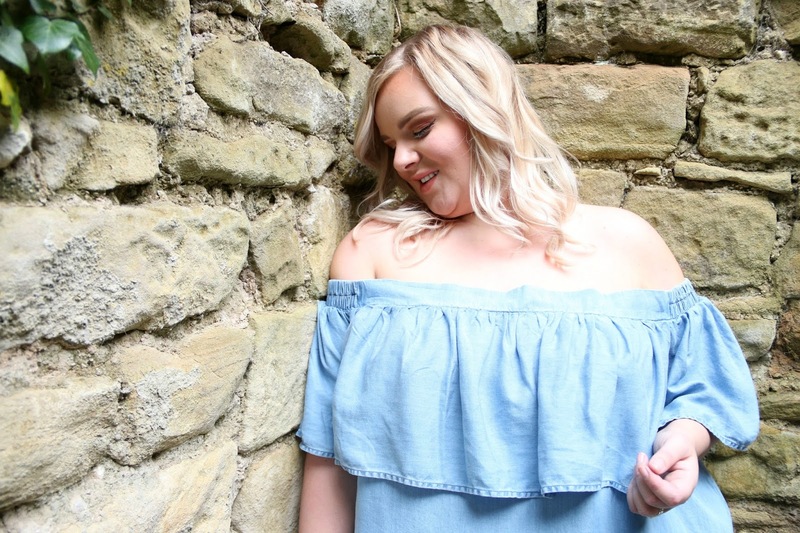 Then I had the idea to try the next size up on and with the added length it gave me and the loose fit around my tummy, I saw that this Chambray Denim Ruffle Bardot Swing Top would actually look gorgeous as a swing dress which is actually far more suited to my style. 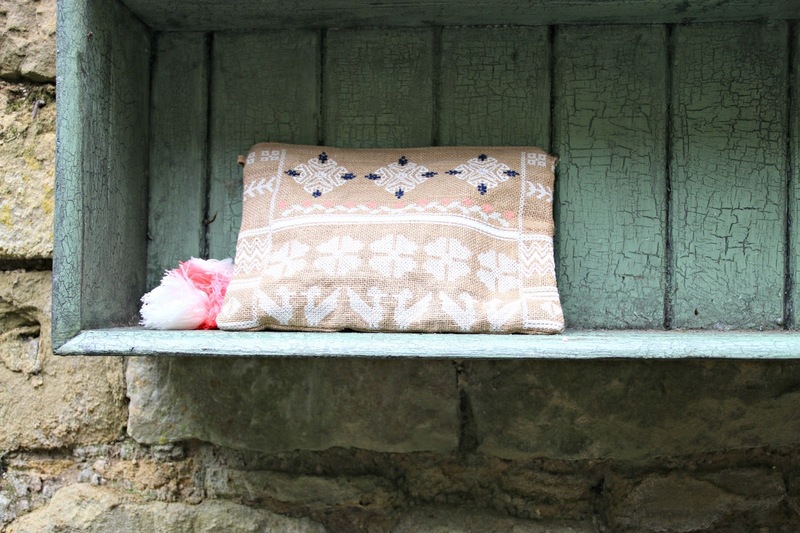 I’d much rather wear this piece as a dress with sandals during the day or even for afternoon-into-evening drinks during the summer than as a top with trousers or leggings! Not being confined by the clothes label really worked for me and low and behold, here I am at the stunning Alnwick Garden, top tourist attraction in Northumberland, loving the outfit I have created with this piece as a result! After shooting these images, I’ve had the back of the dress taken in a little bit to make it smaller across my shoulders for the perfect fit and I feel even more confident and happy wearing it. The only thing that matters is that you’re able to put together outfits that you love and feel happy comfortable and confident in. Its all about how you feel you look in your clothes. What is flattering to one person may be entirely different to another and others may not care about whether or not a garment is flattering; regardless, all that matters is that you love it. The only opinion that matters is your own. There are parts of my body that I love to accentuate the most and I like to choose styles, fabrics and colours that I find are flattering and comfortable on me because they give me an added confidence boost but that doesn’t stop me from being proud of who I am and truly loving my whole body. I spent so much of my younger years hating myself for the way that I looked rather than appreciating the body that had been the home for my soul for all of those years, that now I spend my days loving every inch of me, regardless of how society tells me I should look. I’m going away on a once in a lifetime trip very soon and I’ll be styling this piece up with tan shoes and a clutch while enjoying a cocktail or two in the sunshine. Now that sounds much better than crying over the numbers on the label doesn’t it? Ladies, please don’t get hung up on the label inside your clothes. you can be stylish, confident and work it at any size. Your clothing label size doesn’t matter, loving yourself and feeling body confident does! How do you feel about your clothing label size; do you feel confined and restricted by it? Would you wear items in a different size to the one you usually are? How do you like how I’ve styled this top/dress at The Alnwick Garden? Wise, wise words. The crazy thing is that sizes are always changing too. A size 6 five years ago isn't a size 6 today. In the U.S. the sizes have gotten roomier over the years .. for just the reason you wrote so eloquently about. Manufactures know the mental game all too well and have made the most of it. You look great hun and i hate sizes in clothes – some shops i differ up to 3 sizes!! Your Images do look great and I kind of get your message….YET!Size matters only for health purposes. Our bones can only car so much body mass. And our Systems too. Otherwise if you are a plus size fit babe or dude, you feel good about you, can go up a flight of stairs without pulling a sweat or getting out of breath, it doesnt matter. I don't care about sizes as they are meaningless, completely different in every shop. I do wish I could get clothes which fit me properly though as nothing ever fits my waist, hips or bust! I agree there is a lot of inconsistency from brand to brand in regards to size it can be very annoying. Awesome post honey! Great advice especially the conditioning yourself into a certain label size trap! We all do it! Oh and those shoes and bag are just ADORBALE! I've ranged from a size 14-22 over the past 5 years and can certainly vouch for the fact that clothes size means nothing. If you are plus size try something on from the straight size range, tunic tops and swing dresses might fit. Man I love this post!! Can relate a lot!! I have struggled with my weight for ages and it fluctuates, having two kids has changed my body shape and size and so I'm very critical of myself especially when it comes to choosing clothes for myself. I try something on and think oh no this doesn't look okay on me I'm too big to make it look nice and I know thats just such a bad and wrong mentality to have!! You have given me so much confidence reading this! and btw loveeee the dress you're wearing in this post! 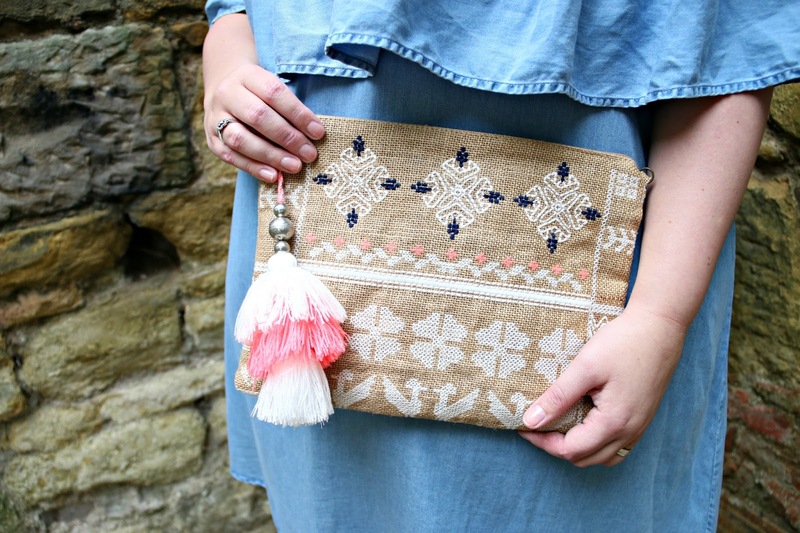 You look amazing and I adore your bag! This is a great post. I have been struggling and feeling upset after gaining a stone in weight and going up a size once again. It's a battle for me and i am trying to be happy in what i wear. Love love LOVE the message of this post. I wasted so much of my teenage years into early twenties not wearing certain things, not going to the beach, swimming etc.. just because I wasn't a particular size. I felt that I needed to drop one more dress size to be worthy of certain outfits. Now at 30 I no longer care about sizing and am much happier.